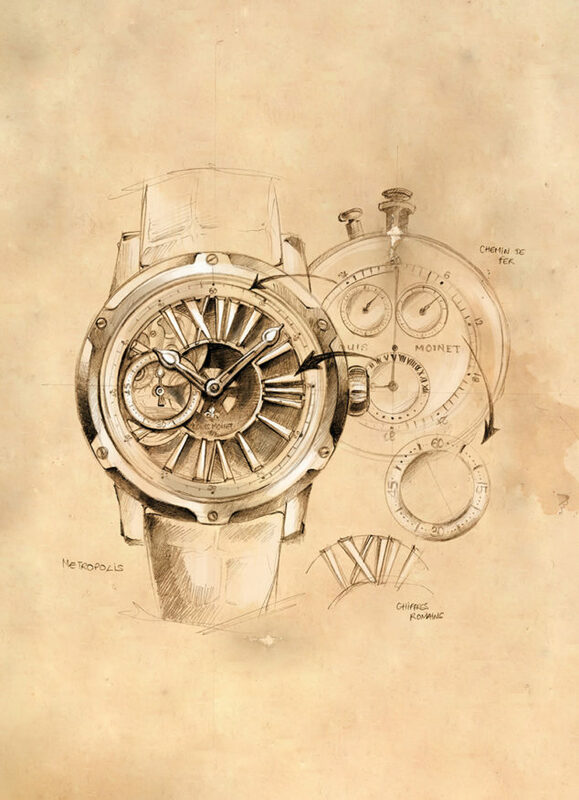 The timepiece was – and still is – the one and only creation by Louis Moinet to feature Roman numeral hour markers. Their design is directly based on the design created by Louis Moinet himself for his Compteur de Tierces – the first certified chronograph in history, completed in 1816 and now preserved in the Louis Moinet Museum. Rarer still, the hour markers are arranged around a highly structured dial, in a shade of blue creating unprecedented levels of contrast and brightness in watchmaking: Magic Blue. This particular blue is unlike anything achieved using enamel, lacquer, or galvanisation, providing a unique sense of depth and power, and evocative of the immensity of the galaxy whose mysteries Louis Moinet himself investigated through astronomy. 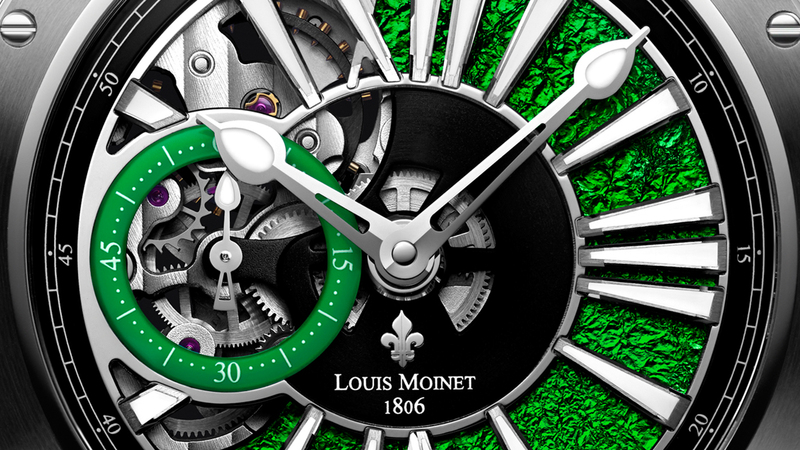 Now, Ateliers Louis Moinet have achieved the equivalent depth of colour for another hue: the resplendent Magic Green. It took almost a year of development to find a Magic Green that could rival the intensity and power of Magic Blue. This alternative colour gives the Metropolis a new splendour, highlighting its modernistic inspiration. The timepiece blends the visionary talent of the inventor of the chronograph and high-frequency horology with a profoundly architectural work. Breaking free of neoclassical convention, Ateliers Louis Moinet have adopted a distinctive, contemporary approach unlike anything they have ever done before. The Metropolis features three different sets of openwork – on the hour markers, on the dial, and on the lugs and vertical bridges – giving the timepiece a uniquely three-dimensional aspect. The first openwork feature is on the Roman numeral hour markers, themselves a first for a Louis Moinet timepiece. The Ateliers have therefore taken extra special care with them, so as to ensure a completely new, ultra-modern result. Light dances off each hour marker’s three differently-shaped faces. Each side sports a diamond-cut, satin-finish section that reflects light deep into the dial, setting the timepiece sparkling with life. The colour contrast is enhanced by the white lacquer coating on each hour marker. The hour markers themselves are suspended in mid-air, adding a further sense of depth. In a rare feat of craftsmanship, each marker is linked to a black central ring and a flange made from neoralithe, an innovative material chosen by Louis Moinet for its purity. The Metropolis still has all the distinctive features of a Louis Moinet. The LM45 caliber, boasting a 48-hour power reserve, is completely new. It was designed and assembled in accordance with the firm’s most stringent chronometric requirements, and bears the Louis Moinet hallmarks that embody the firm’s values: a fleur de lys, recalling the unique history of the original creator, two keys symbolising creative watchmaking, a lion representing art and design, and a star, denoting rarity. The dial features the second openwork aspect of the Metropolis: located between 8 o’clock and 12 o’clock, this reveals each and every beat of its exclusive caliber. The escapement (generating 28,800 vibrations per hour) and the offset seconds hand are displayed in all their glory – and carefully arranged to ensure an unobstructed view of every detail of the Metropolis’ workings. The movement’s finishes embody all the noble traditions of fine watchmaking: Côtes de Genève, diamond-cut angles, circular-grained wheels, and pearling. 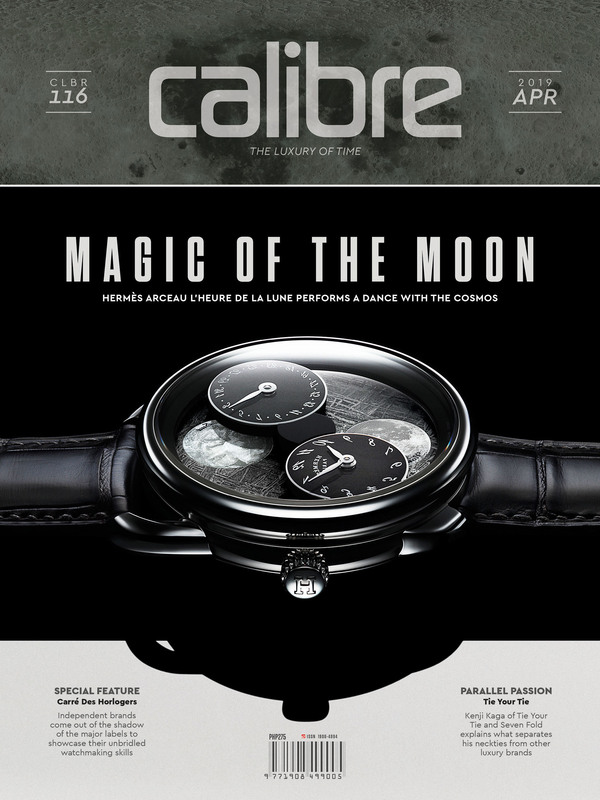 The sapphire caseback, meanwhile, reveals the movement of the rotor, mounted on a ball bearing. There’s also a new, concentric version of the Clou de Paris pattern, much beloved of Louis Moinet in the nineteenth century, conveying a striking impression of motion. The hours, minutes, and seconds are read off by Louis Moinet’s iconic double-lined “Gouttes de Rosée” dewdrop hands. A total of no fewer than 55 different parts all contribute to the creation of a unique visual effect. 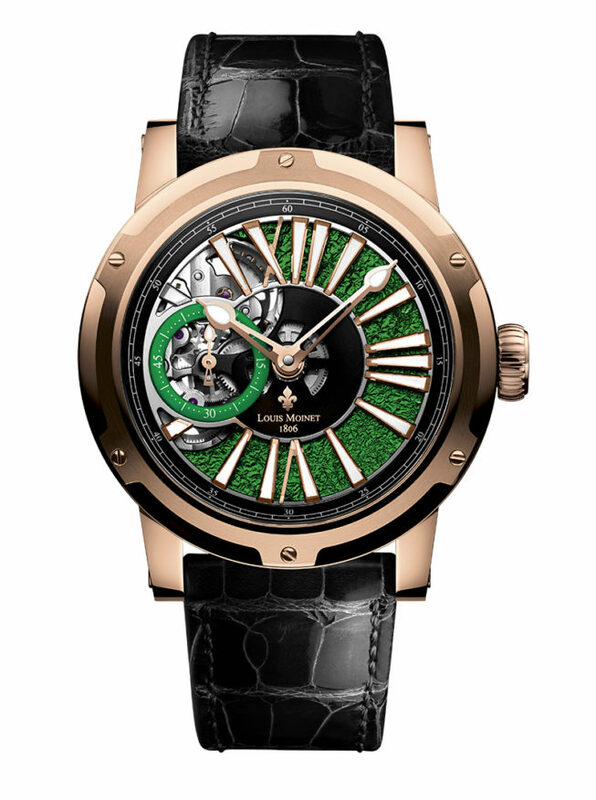 The crocodile strap comes with a folding clasp decorated with Louis Moinet’s characteristic Fleur de Lys symbol. Metropolis Magic Green will be available in spring 2018, in two initial limited editions of 60, in steel and 18K rose gold; prices start at CHF 10,500.